On the morning of 13 November in Beijing, CCCWS Deputy Director-General Jin Xin met with Dr. Mathieu Duchatel, Senior Researcher and Head of Project of Stockholm International Peace Research Institute (SIPRI). The two sides exchanged views on China-Europe relations, the US returning to Asia-Pacific region, Diaoyu Island disputes and think tank exchanges. 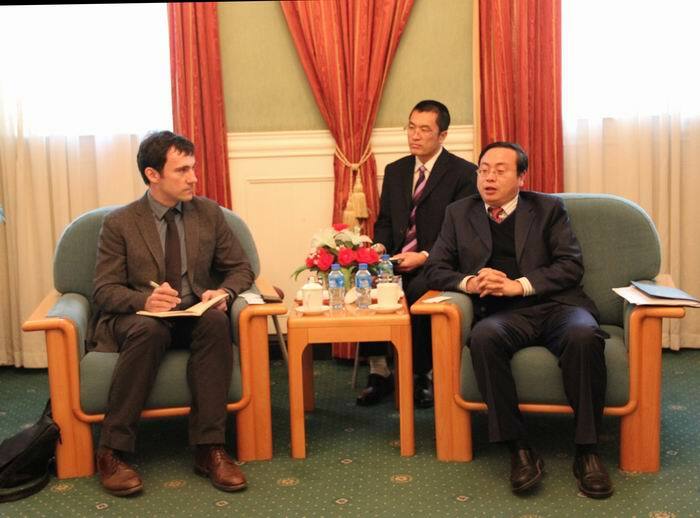 CCCWS Deputy Director-General Jin Xin meets with SIPRI scholars. Also present at the meeting were CCCWS Research Fellows Yang Hongxi, Mou Hong, Gao Lianjia, Associate Research Fellow Lin Yongliang, SIPRI scholars Phillip Schell and Zhou Hang.